HDR10+ gets logo, gains more industry support | What Hi-Fi? The HDR 10+ Alliance firms up the logo and certification, and confirms Warner Bros. backing. As we head into 2018 – two years after High Dynamic Range (HDR) appeared on the AV map – the TV technology is arguably as confusing as it’s ever been. Today, there are five HDR formats (some of which are competing against one another), backed by different AV brands and film studios, and some more prevalent than others. One of these formats is Samsung’s HDR10+, which, just like Dolby Vision HDR, adds dynamic metadata to an HDR signal to further boost the image. But while TV manufacturers and studios have to pay Dolby to license Dolby Vision, HDR10+ is a royalty-free, open format that any company willing to pay a “nominal” annual administrative fee can use and tweak as it sees fit. Despite the growing ubiquity of Dolby Vision, HDR10+ has been picking up support of late. Last month, Amazon Prime Video became the first streaming service to deliver HDR10+, making its entire HDR library (mostly Amazon Originals) available in the format. And now Warner Bros. Home Entertainment has just signed up to provide HDR10+ content, too. 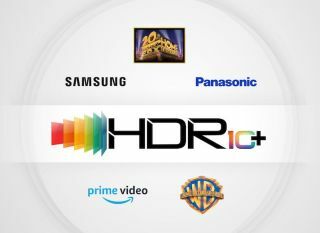 The very latest news: with Samsung having partnered with Panasonic and 20th Century Fox last summer to form the HDR10+ Alliance, the three founding firms have now announced updates to the certification - and a logo (above)! The HDR10+ license program will provide interested companies - of which there are apparently 25 - with the technical and testing specifications to implement HDR10+, which will “soon” be made available to content companies and manufacturers of 4K TVs, 4K Blu-ray disc players and set-top boxes. So how will it be regulated? Certification for devices will be performed by a third-party testing centre, and certified products will, naturally, bear the new HDR10+ logo. 20th Century Fox, Panasonic and Samsung are all set to demo HDR10+ technology at CES 2018, and we wouldn’t fall off our chair if next week we hear that more brands are joining them.